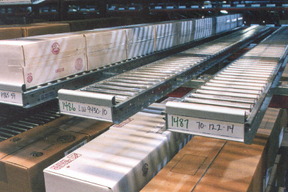 High profile Span Track carton flow is designed to sit on top of pallet rack beams to provide the most adjustability, front to back, side to side. It locks into place on retainer angle, which is mounted on the rack beam. How long should your High Profile tracks be? Unsupported spans of up to 10' are possible, depending on product weights. High profile Span Track is configured by measuring the level distance from the outside of the front beam to the outside of the rear load beam. This is called the Out-to-Out beam dimension. High Profile can overhang beams at front, back, or both ends. Measure level distance from outside to outside of front and rear beams to determine needed track length - your track's length must exceed that measurement. If you have questions, call Customer Service. We can assist you in calculating the correct length and capacity Span Track for your application. NOTE: we offer tracks from 43" to 96" in our online catalog. Lengths from 36" to 144" are also available. Contact us for information. Set the pitch at 1" per foot (a 36" track would need 3" pitch). Pitch requirements may vary based on carton quality, firmness against the track, product weight, or other factors. We suggest that you set the first level, check the pitch to be sure it's working, then move on to installing subsequent levels. The best way is to install a shelf at the proper pitch and let it sit 24 hours. Then, remove cartons at the pick face to check resulting flow. High Profile Span Track comes in 4 widths: 6", 9", 12", and 15". (We offer only 9" and 12" in our online catalog, but 6" and 15" models are just as readily available). These widths are nominal. The actual width is 3/4" wider. So when calculating the number of tracks that can fit onto your beam, take the 3/4" expansion per track into account. Most applications won't require the total left-to-right density of flow tracks, since you can specify track widths to carry cartons wider than the track itself.